Today's card is quick and easy and it's up on the Rubbernecker Blog today. I had used the Mixable Flower Stack Die to cut the flowers out of pink paper for another project and had this leftover pink die cut piece on my desk. Being the crafter that I am, I just don't want to throw paper away. I'm sure you guys know what I'm talking about! 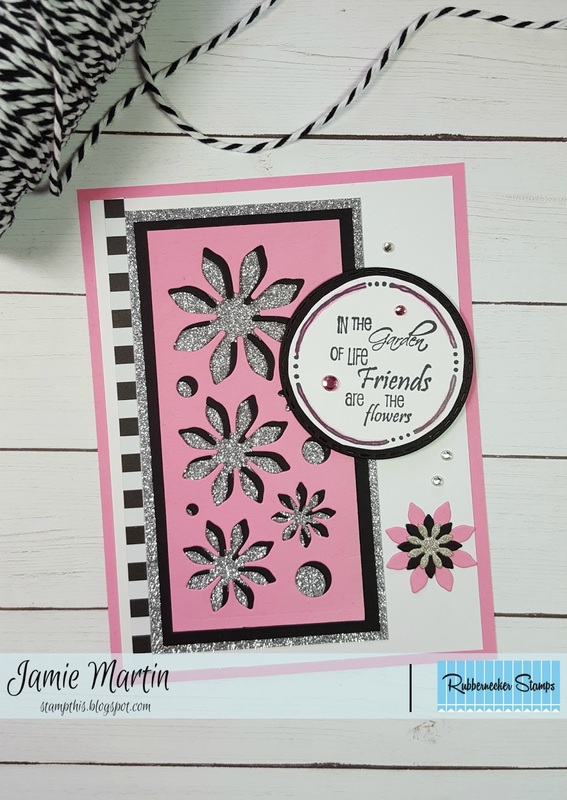 So I used the Mixable Flower Stack Die with black paper, layering it underneath the pink but just slightly to the side to give a shadow effect. This was then layered onto silver glitter paper. This was glued onto a white panel with a decorative paper strip down one side and glued to a pink card. The sentiment is from the Freehand Border Phrase Set and the flowers below it are the die cut pieces from the Mixable Flower Stack Die. Disclaimer- I get free goodies for blogging about craft products! 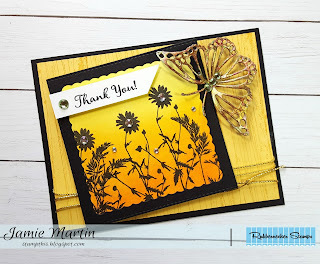 Today I'm sharing a card made with products from Rubbernecker Stamps. It's Sneak Peek week for the new Stampendous July Catalog and each of the Design Team Members will be sharing a card they made for the catalog. The card I have is one using the Peppermint Sled stamp and a sentiment from the Snowman Accessories Pieces. Stamp Peppermint Sled on white cardstock with black ink and color with pencils. 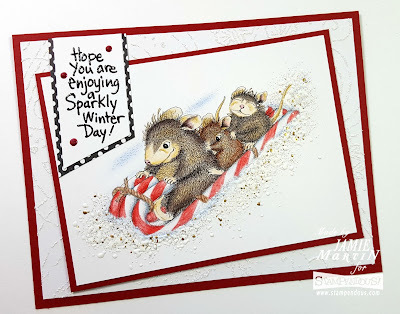 Sprinkle Shabby White Embossing Powder below the sled and heat from underneath so the powder doesn't blow off. Glue to a larger red panel and set aside. Stamp a white panel with Cling Winter Blizzard using VersaMark Ink and emboss with Sparkle Puff Embossing Powder. Layer onto a red card. Glue Peppermint Sled diagonally onto this. Stamp sentiment from the Snowman Accessories Pieces Perfectly Clear Set on a strip of white cardstock with black ink and emboss with clear. Layer sentiment strip onto decorative paper and glue to the top of the white panel. Randomly apply Autumn Red Nuvo Crystal Drops around the sentiment. I'm also entering my card in the House-Mouse & Friends Challenge #268. The theme is always "Anything Goes" or you can use the weekly theme. Disclaimer- I get free goodies for blogging about craft products! 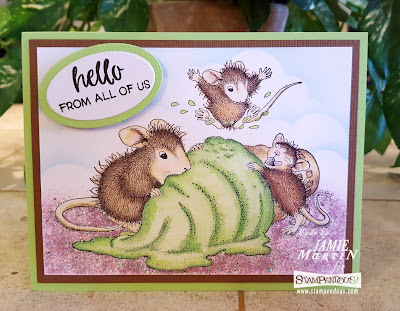 Today I'm sharing a card made with products from Stampendous. With the Stampendous July catalog coming out soon, I'm finishing up sharing the cards I had made for the April catalog. This one uses the super cute Bubble Popper House-Mouse stamp. 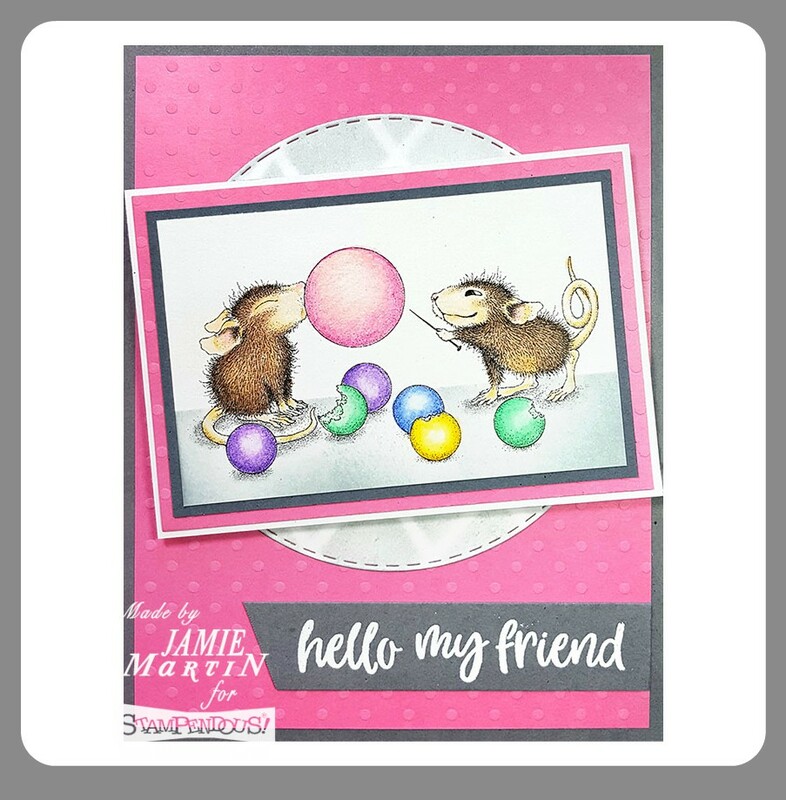 Stamp Bubble Popper on white cardstock with black ink and color with pencils and layer onto grey, pink and white papers. Stamp sentiment from Greeting Galore with VersaMark Ink on a strip of gray paper, emboss with white embossing powder and set aside. Place the Diamond Grid Metal Stencil on white cardstock and sponge with London Fog Ink and die cut with a circle die. 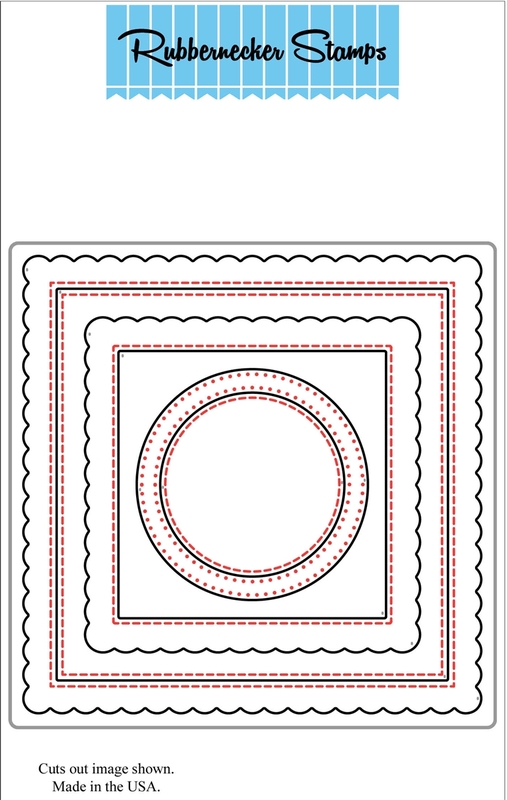 Glue die cut circle onto a pink panel and glue to a gray card. Pop up Bubble Popper with foam squares diagonally on the circle. Glue sentiment underneath the circle on the right side. 1. The Thistle was stamped on a white cardstock frame that was die cut using the new Square Combo Die, with black ink and embossed with clear embossing powder. 2. Yellow and orange Distress Inks were sponged over the Thistle and glued to a larger black panel. Set aside. 3. 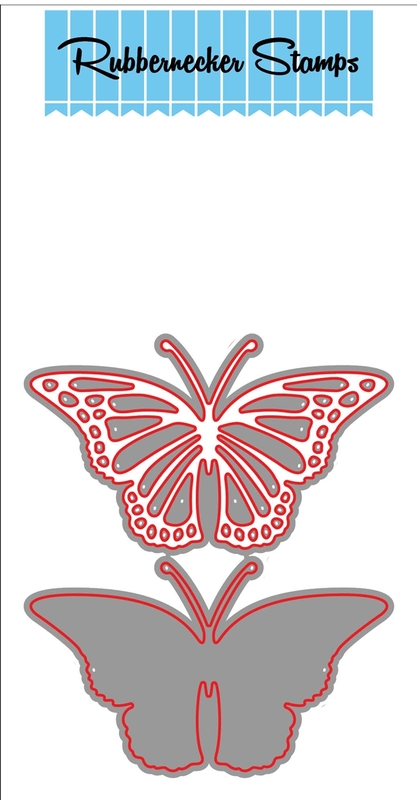 The butterfly was die cut using the 2 Part Butterfly #3 Die. 4. Double sided sticker paper was layered onto a square piece of cardstock then cut out. 5. Next is to add gold leafing by peeling off the top carrier of the double-sided sticker paper, then rubbing the sticky side with the gold leaf. You then need to burnish it with texture sponge to remove all extra pieces of gold leaf flakes. Bend wings and add rhinestones on the body. Set aside. 6. Stamp the Wood Fence Background on a goldenrod panel with Tea Dye Distress Ink, tie with gold cord and glue to a black card. 7. Glue the Thistle panel and the butterfly to the card. 8. Stamp sentiment from the Best Friends Etc set on a strip of white cardstock with black ink and emboss with clear embossing powder. Pop up on top of the Thistle panel and add a rhinestone. 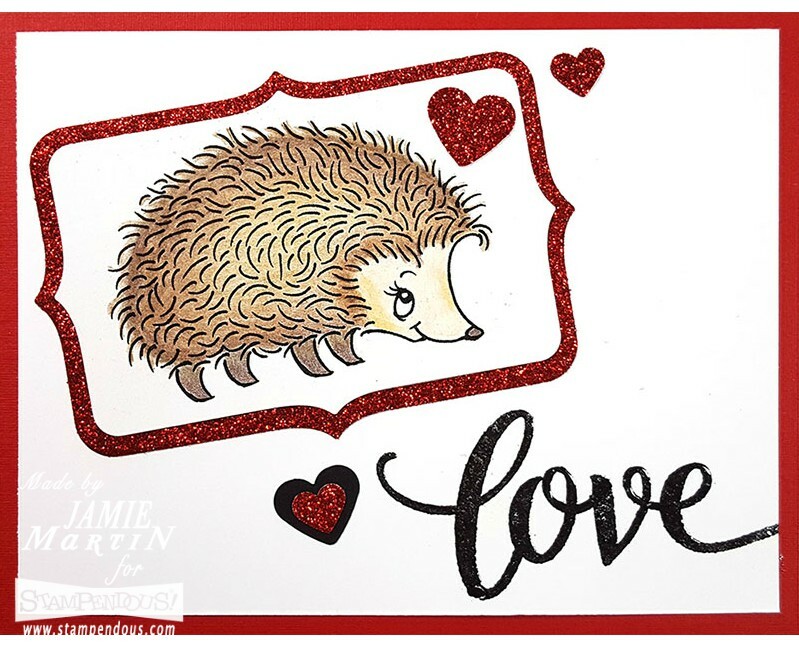 Today I have a little furry friend to share, the new Happy Hedgehog from Stampendous. I can just imagine this shy little guy telling his fluffy hedgehog girlfriend he loves her. But if you need a card for a different occasion, just look at all of the different sayings that come in the Big Words Happy Perfectly Clear Set below! Stamp Happy Hedgehog on white cardstock with black ink and color with colored pencils. Die cut with Fitted Frames B Set, layer onto a larger piece of red glitter paper and glue diagonally onto a white cardstock panel. 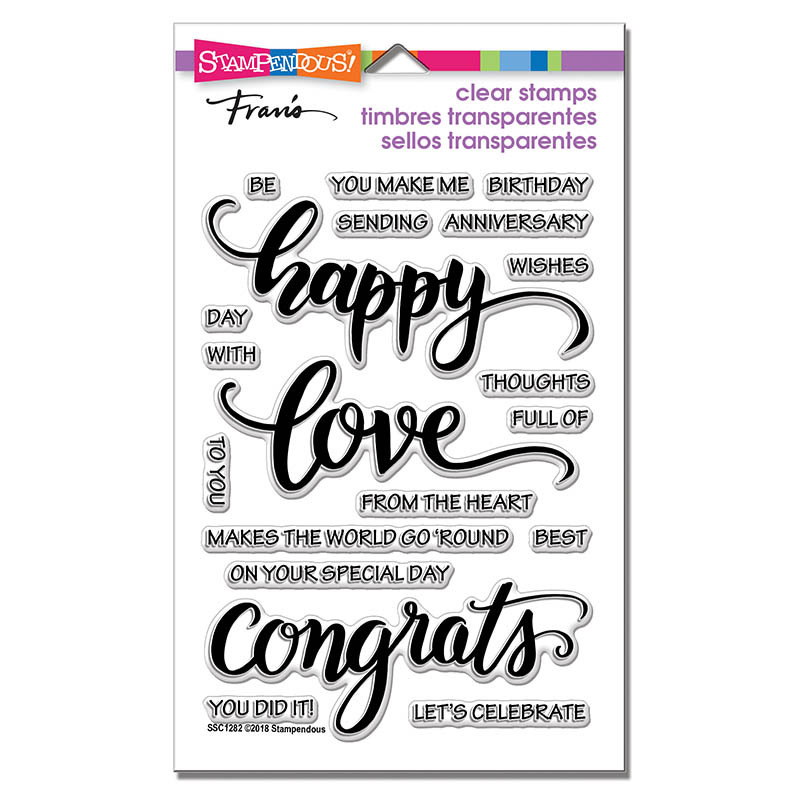 Stamp Love from the Big Words Happy Set with black ink and emboss with clear embossing powder. Use a heart punch to punch out hearts from red glitter paper and black cardstock. Glue to panel and glue panel to a red card. These little Ice Cream Crazy mice sure do look happy eating their ice cream, I'd like to join them! 1. Stamp Ice Cream Crazy with black ink and color with pencils. 2. Use the Picasso Metal Shield to create clouds with blue ink. 3. Sprinkle Vintage Pink Tinsel Embossing Powder on the bottom of the card. 4. Us a brush to brush off the embossing powder from the image. 5. Heat powder from underneath so it doesn't blow off. 6. Glue to a brown panel then onto a green card. 7. 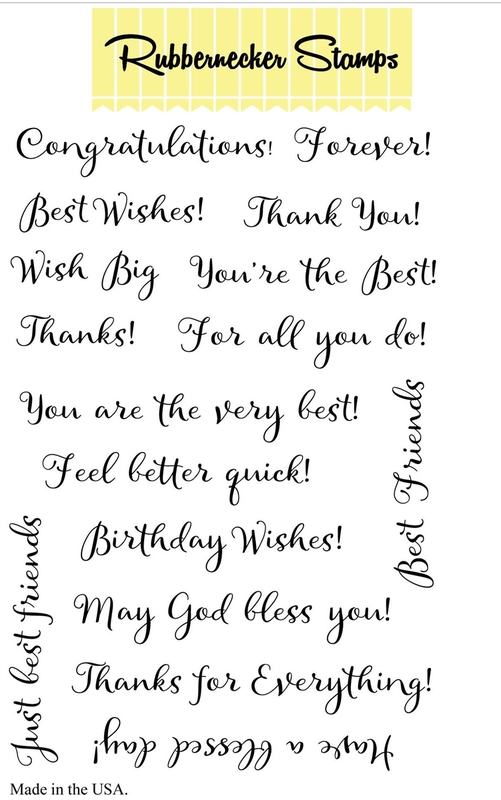 Stamp sentiment from the Greeting Galore Set onto white paper with black ink and die cut with an oval die. Layer onto a larger green oval.